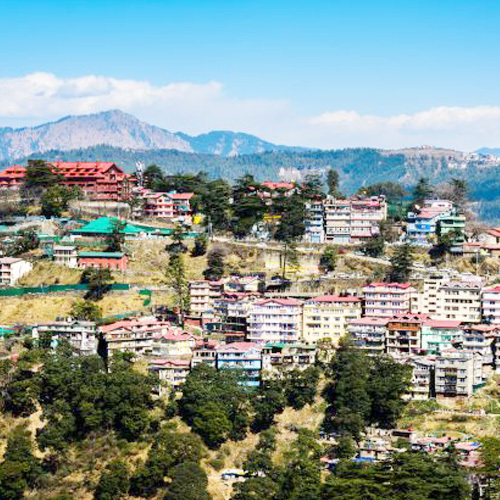 Situated in the western part of Himachal Pradesh, spread between the Shivalik foot Hills and the Dhauladhar range, the Kangra valley is a land of gentle beauty. Kangra is known for the oldest serving Royal Dynasty in the world Katoch. Kangra became a district of British-India in 1846, when it was ceded to British India at the conclusion of the first Anglo-Sikh war. The British district included the present-day districts of Kangra, Hamirpur, Kullu and Lahaul & Spiti. Kangra District was part of the British Province of Punjab. The administrative headquarters of the district were initially at Kangra, but were moved to Dharamshala in 1855. This area was significantly damaged by an earthquake on April 4, 1905. The history of Kangra town is approx 3500 years old. It was called Nagarkot at that period and was the capital of Trigartha. The ruined fort – Nagarkot, stands as a testimony to its glorious past. The town was attacked by Mohammed Ghaznavi and subjugated by Emperor Feroz Tuglak. Earlier, Kangra was the capital of the great hill state, its renowned ruler being Maharaja Sansar Chand Katoch, a great patron of arts. The Miniature and Rajpur Schools of hill paintings flourished during his reign. Kangra valley has numerous temples and forts. The two most famous temples of this region are Brajeshwari Devi Temple and Jwalamukhi Temple. The valley also offers a picturesque view of undulating expanses of tea gardens and terraced rice fields spread all around. Today, the “Kangra tea” with its centre at Palampur, has been acclaimed internationally. Andretta POTTERIES: You could visit Andretta the charming village, once the home of the famous painter Sardar Shobha Singh and playwright Norah Richards. You could actually see the works of Sardar Shobha Singh. It is now transferred into a center for varied artistic activities. Pottery lessons could be had here at cost. The Punjabi University holds an annual competition in Andretta in honor of Norah Richard in which plays are staged in the open. Many living artists have made this village their home due to its scenic location and quietness. 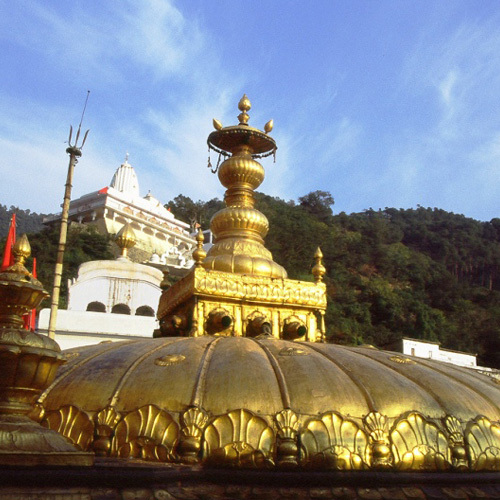 BREJESHWARI DEVI TEMPLE: Just outside Kangra town, is the temple dedicated to the “living deity” – Brajeshwari Devi. It is a famous Shaktipeeth where the left breast of Pauranik Sati Parvati is stated to have fallen. The Devi is worshipped in the form of Pindi. A legend avers that the body of demon king Jalandhara is buried at this place. Known once for its legendary wealth, this temple was subjected to successive damages by invaders from the North. Mohammed of Ghazni is known to have departed with a king’s ransom in gold, silver and jewels in 1009. The temple was destroyed completely in 1905 by a devastating earthquake but was rebuilt in 1920. JAWALAJI TEMPLE: 34 km southwest of Kangra, is the North India’s most important Hindu shrine – the Jwalamukhi Temple. It is believed to be the only temple of its kind in India where natural jets of flame flare out from the hillside covered by the ancient, holy edifice. The temple has been a great pilgrimage for an assortment of people down the centuries. 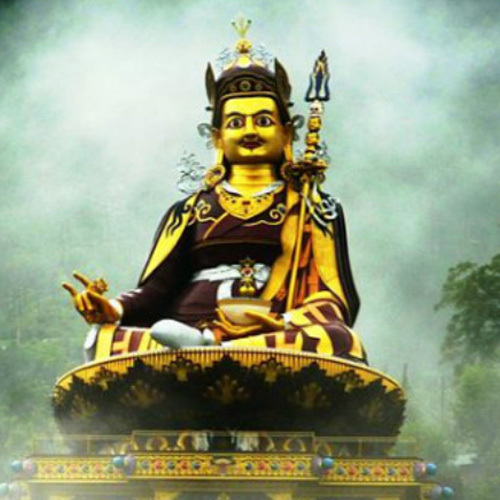 The temple lies in the lap of Shivalik range of Kangra valley called “Kalidhar”. This is believed to be the first ever temple built by the Pandavas. MASROOR ROCK CUT TEMPLES: The famous Masroor temple complex lies nearly 22 km from Kangra and 40 Km from Dharamshala. It lies to the north-east of the village, a rocky sandstone ridge, the main axis of which runs from north-west to south-east. An outcrop of sandstone rock, the highest central portion of which has been separated from the rest by two transverse and more or less parallel cuttings, it accentuates the crest of the hill. In the intervening portions of the rocks are sculpted a series of temples unique in the entire Himalayan region and comparable to the monolithic temples of Mahabalipuram, Ellora and Dhamnar caves. In the centre of the complex stands the principal and most elaborately carved shrine – the Thakurdwara – enshrining black stone images of Ram, Lakshman and Sita facing east. CHAMUNDA DEVI TEMPLE: Situated at about 20 km from Dharamshala, Chamunda Nandikeshwar Dham is an abode of Shiva Shakti since the saga of Puranas. According to a legend, the Goddess Chamunda was enshrined as chief Goddess with the title of Rudra in the battle between demon Jalandhra and Lord Shiva which made this place famous as “Rudra Chamunda”. BAIJNATH TEMPLE: A Shiva temple dedicated to Shiva Vaidyanatha, associated with mythology. It is supposed to be the temple where Ravana Worshipped Shiva to gain immortality. The Baijnath is supposed to be one of the twelve ‘Jyotirlingas’ and is thronged with pilgrims at the festival of Shivratri. KANGRA FORT: The ruins of this formidable fort of the rulers of Kangra are located on a strategic height, overlooking the Ban Ganga and Manjhi rivers. The historic fort of kangra was built by Bhuma Chand the founder of the Katoch Dynasty. There are two Hindu temples within the fort’s compound; one dedicated to Ambika Devi (a local deity) and the other to Laxminarayan. A Jain temple is also present with the stone image of Adinath. The history of this fort is synonymous with Kangra town. The town belonged to him who owned the fort. The most attractive part of this Fort is inside the Darshani Darwaza. This gate is one of the oldest standing structures. It opens up to a large stone-paved courtyard surrounded by various chambers. This fort had been the centre of attraction for the rulers of Northern India. Since Long Time the first attack on the fort was made by Raja of Kashmir, Shreshta in A.D.470. In 1009 Muhammad Gazni Looted the Kangra Fort. He Carried with him 7 Lakh gold Coins, 28 tonne utensils mode of Gold and Silver and 8 tonnes of Diamond and Pearls. In 1337 Muhammad Tughlaq and in 1357 Feroze Shah captured the Kangra Fort. In 1540 the fort was captured by Khan Jahan a commander of Sher Shah Suri. In 1620 Jehangir occupied the Kangra Fort and came to see it in 1622. In 1781 it came under the control of Jassa Singh Kanhaya. In 1786 Maharaja Sansar Chand took control of the fort. In 1846 the Kangra Fort fell into the hands of the British. The Fort is located on the Banks of the River Ban Ganga. Inside the Fort are two ponds one of them is called Kapoor Sagar. At prsent the fort is under the control of the Archaeological Survey of India. It was badly damaged in the 1905 earthquake. SUJANPUR-TIRA: About 80 km from Kangra and 40 km southeast of Palampur, is the fortress of Sujanpur-Tira, located on the right bank of river Beas. It was constructed by the rulers of Kangra in the early 18th century and was a favourite residence of Raja Sansar Chand, a great patron of Kangra miniature paintings. This fortress has some beautiful wall paintings which are worth seeing. NURPUR FORT: Located at an altitude of 2125 ft on the banks of the river Jabbar, the first reference of Nurpur is found in the writings of the historian of the period of Akbar. He referred to the king of Nurpur by the title of Zamindar of Mau and Paithan. The ancient fort of Mau was demolished by Shahjahan. To the ancient it was known as Dhameri. It was renamed by Raja Basu as a mask of Respect to the mughal emperor Shahjahan and empress Noorjahan. It is famous for an old fort and a temple of Brij Raj Bihari. The image according to legend was worshipped by Meera Bai. The fort is in ruins now but still has some carved relief work on stone. KARERI LAKE: Located at a distance of 33 km from Dharamshala and at an altitude of 1,983 metres above the sea level, Kareri village is set amidst beautiful settings. Here lies the impressive Kareri lake 3,048 metres above the sea level amidst green meadows, oak and pine trees making it an idyllic spot to visit. Maharana Pratap Sagar Lake: The Maharana Pratap Sagar Lake, created in 1979 by the construction of Pong Dam across the river Beas, lies to the southwest of Kangra district. It was named after the great patriot Maharana Pratap (1572-97 AD) who struggled valiantly for freedom of Mewar-as for the principle of independence. Over the river Beas, the Pong dam was completed in 1976. Its reservoir covers an area of about 45,000 hectares at maximum possible flooding. The level varies every season and averages around 30000 hectares. This large wetland when fully occupied during flood is a favored stopover for migratory birds from central Asia and is an excellent spot for water sports activities like water-skiing, canoeing, kayaking and leisure boat riding. This palace is now a wildlife sanctuary with over 200 species of migratory birds being spotted in and around the reservoir. GOPALPUR ZOO: Lying on Dharamshala-Palampur road, wildlife department of H.P Government has established a zoo at Gopalpur spread over 12.5 hectares of thick forest. Animals which can be seen here include Asiatic Lion, Himalayan black bear, Leopard, Sambar, hog deer, barking deer, red fox and angora rabbits. Palampur: The picturesque little town of Palampur is about 45 km east of Kangra. The undulating expanses of tea gardens unfold the inimitable beauty of nature. The town came in to being when Dr. Jameson, Superintendent of Botanical Gardens, North-West Frontier Province introduced the tea bush here. Since then the town became a centre for European tea estate owner. Today, the “Kangra tea” with its centre at Palampur, is been internationally acclaimed. The town itself has some interesting colonial architecture and the area around is encompassed by old forts and temples. TEA GARDENS: Tea in Kangra valley was introduced in 1854 when “Holta” tea estate was settled at about 4200 ft above the main sea level. After the devastating earthquake of 1905 annihilating both man and plantation, the tea production lost its paramount position, however, the scene has changed with the setting up of the Council of Scientific and Industrial Research (CSIR), Palampur Complex where scientists are striving to produce tea Production of the one popular Kangra Tea through the scientific methods. The entire tea production of Himachal Pradesh is produced in Kangra especially in the Palampur valley. 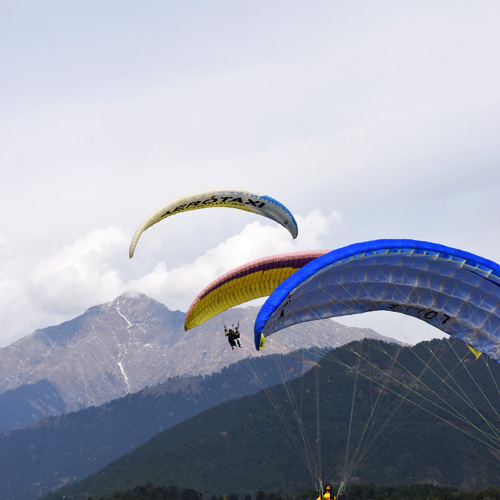 BIR-BILLING: This is one of the most beautiful jeep-able routes in the Kangra valley situated at a height of about 9500 ft. 35 km from Palampur is Bir Town known for the Buddhist monasteries and 14 km from here is the famous aero sport site of Billing. Upto Bir town one can travel by any vehicle. The 14 km distance from Bir to billing is actually a rock road, whose rock cutting was done way back in 1962. This place is the originating point for hang and para gliders. One can fly upto Chamba from here. The aerial view of the Chamba and Kangra valleys are really breathtaking.